HomeWhat do the Peterborough SIB interim results tell us? What do the Peterborough SIB interim results tell us? Update: actual results are now out. First cohort results from the Peterborough SIB were released August 7 2014. The Social Finance UK press release on the results has lots of great information, with a quote below. The results tell us that the reoffending events have improved in the Peterborough cohort as the national average has worsened. We can be fairly confident that the reduction in reoffending is due to the Peterborough SIB, or more specifically the One Service. This in itself is quite an achievement for Government policy. These results are also an excellent demonstration of the need to have a contemporary comparison, in this case the Police National Computer control group, rather than a historical baseline. 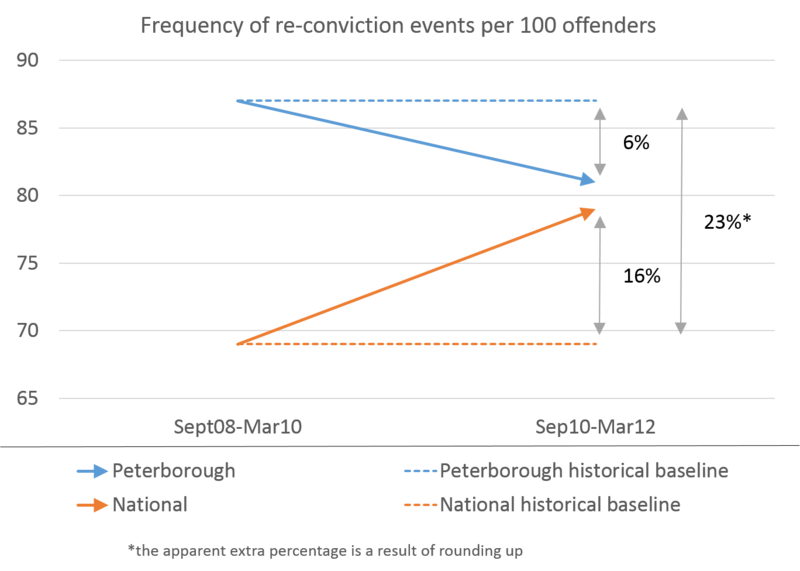 If the historical re-conviction rates at Peterborough had been used as the only comparison, it would appear that a 6% reduction had been produced. Using the national comparison group shows that the programme also counters an increasing trend in re-convictions to produce a relative reduction of 23%. The inability of historical baselines to represent the fluctuating environment affecting reoffending is further illustrated when we look at results leading up to the 2010 launch of the One Service. 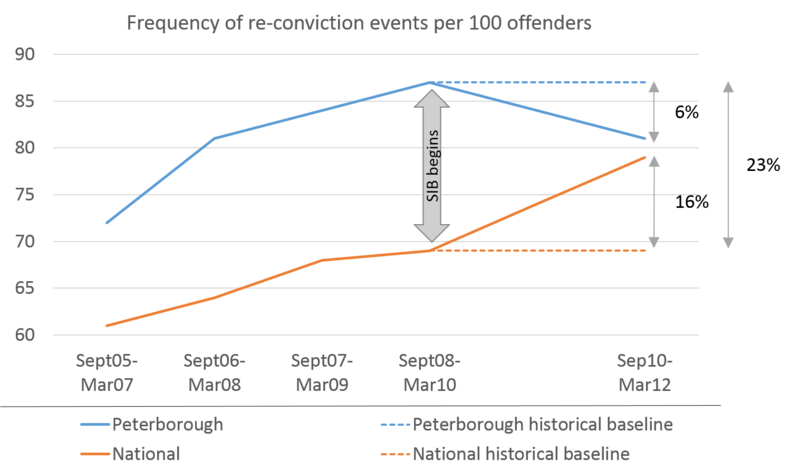 The graph below shows that reoffending by both Peterborough inmates and prisoners across the nation was increasing until SIB services began in 2010, but then reversed in comparison to the national rates. alignment of financial and social returns. The April 2014 evaluation commissioned by the Ministry of Justice from Rand Europe sheds some light on the perceived benefits of the SIB model, including the way the flexibility of funding allows for the service to improve in response to performance management data. And a good analysis of the Peterborough journey and what was learnt is given by the Social Spider here. I have a slightly broader view of SIBs in the context of policy reform, but I like the discussion. Ministry of Justice, Statistical Notice: Interim re-conviction figures for the Peterborough and Doncaster Payment by Results pilots. 12 June 2013. Social Finance, Interim Re-Conviction Figures for Peterborough Social Impact Bond Pilot, press release 13 June 2013. Ministry of Justice, Mentoring Scheme Reduces Reoffending, press release 13 June 2013. Vibeka Mair, Peterborough social impact bond has slashed reoffending rates says MoJ, Civil Society Finance, 13 June 2013. Alan Travis, Pilot schemes to cut reoffending show mixed results, The Guardian, 13 June 2013. BBC, Prison payment-by-results schemes see reoffending cut, 13 June 2013. Nicholls, A. & Tomkinson,E. Case Study – The Peterborough Pilot Social Impact Bond – Oct 2013, Oct 2013. So Peterborough re-offending has decreased by 6%, the comparison group of 10,000 increased by 16%. For investors to receive a ROI the re-offending has to decrease by 7.5%. But as I understand the 7.5% reduction is not based on previous re-conviction rates at Peterborough, it is compared against the cohort of 10,000. Therefore, if the actual results were the same, would the investors receive their ROI? Or is the comparison that the national cohort has a frequency rate of 79 re-convictions, whilst Peterborough has 81? And therefore Peterborough has not got a reduction on the National cohort? Hope you can clear up my confusion. These results don’t measure the results in the same way as the payment metric, so they don’t tell us whether the investors will receive payments. However, when the results are out, if they are similar to these, i.e. for one cohort there is an improvement of more than 10% compared to a matched comparison group (the 23% fits that criteria), then the investors would receive some payment. The 7.5% threshold is over three cohorts, so any payments related to that are a long way off. So these results are a good sign, but we still don’t know whether any payments will be made.